Now you can own the world's number one hydraulic door for as little as $49.99 per week! Leasing is one of the most popular, smart and cost effective ways to acquire capital equipment. Now a hydraulic door IS capital equipment. Hydroswing® is proud to introduce Hydroswing® Leasing. Leasing helps the cash flow crunch while allowing you to quickly acquire the latest technology. 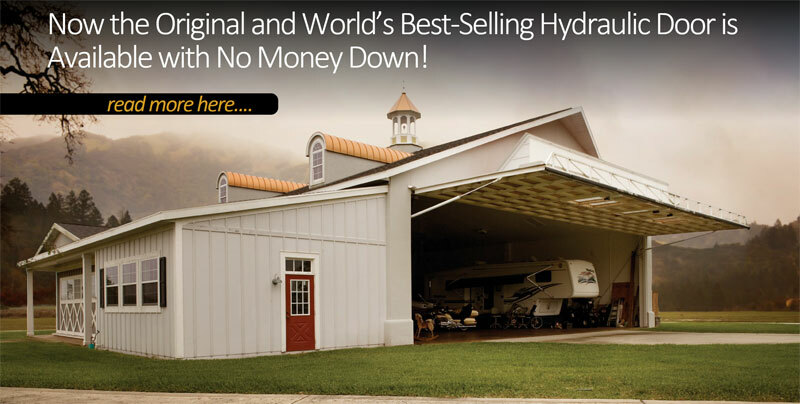 Machinery and equipment expense typically represent a major cost in all sectors so Hydroswing® has created a way for owners to obtain the door they need at a price they can afford. With this new leasing program, for only $49.99 per week and zero down, Hydroswing® will deliver your door. We wanted to come up with a way that owners could easily build out a new structure or change out their obsolete door system and enjoy the efficiency and advanced technology of a Hydroswing® door. Hydroswing® has always been innovative and on the cutting edge and we realized that leasing was the answer. This will change everything for those who want to conserve cash, get an immediate write-off of dollars spent on the door and have the opportunity to eliminate or minimize shipping and install costs. Hydroswing® Leasing is a game changer for industry. Hydroswing® has over 7,000 doors in use and is being manufactured in ISO 9001 approved manufacturing plants worldwide.